The start of Elemental Fitness was personal training sessions with a kickboxing twist, this gave us the edge on adherence to training as it made the cardio aspect more engaging. Along with using it as a style of cardio training we also do 1-2-1 tuition to help those grading for belts or to improve technique. If you are new to this form of martial arts it is a brilliant place to start. 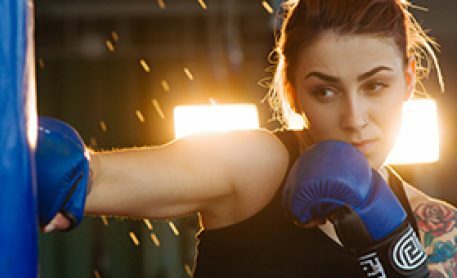 Freestyle kickboxing incorporates the styles of traditional western boxing, the discipline of karate, the elegance and leg strikes of Tae Kwon Do and the brutal use elbow and knees of Muay Thai. Therefore, not only are you getting fit with some intense, fun and varied cardio you’re also learning a new skill too – you can’t go wrong! Along with this, we can help we flexibility, sparring, and discipline. Like everything at Elemental Fitness, kickboxing is not mandatory. It is down to you whether you choose to incorporate it into your training. Elemental Fitness boasts two full-time Black Belt level personal trainers with over 26 years combined experience. Add to this a BSc in Sports, Health, Exercise & Nutrition and an NVQ level 4 in personal training you will receive a complete workout tailored to any of your wants and needs.